Terra Forming Terra: WTF Happened to Golden Rice? We keep forgetting that most good ideas in science die when the rubber hits the road. The types of concerns that i have uncovered regarding Roundup and Neonics explain clearly why. In fact all biological experiments need to be subjected to real world conditions to discover what the stress will do to fix things. We usually get surprised and often disappointed. Golden rice is proving to be just a failing good idea that may need another trip to the drawing board. Besides, what is wrong with yams and carrots?. "This Rice Could Save a Million Kids a Year," announced aTime magazine cover back in 2000. Orange in color, the rice is genetically modified to contain a jolt of beta-carotene, the stuff that gives carrots their hue and that our bodies transform into vitamin A. Diets deficient in that key micronutrient are the leading cause of blindness of children in the global south, where rice tends to be a staple grain. A decade and a half since the Time article, golden rice has yet to be planted commercially—but it continues generating bumper crops of hype. 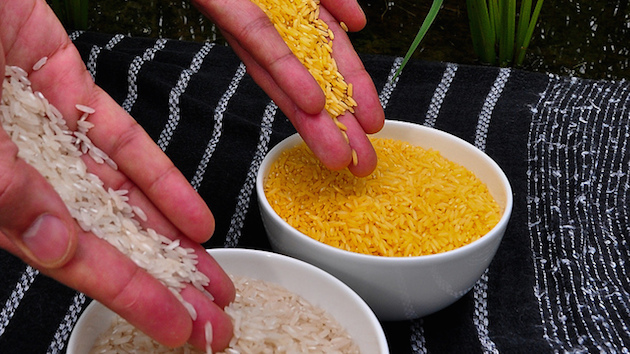 "Is Golden Rice the Future of Food?" the great hipster-foodie journal Lucky Peach wondered last fall, adding that "it might save millions from malnutrition." Golden rice has yet to be planted commercially—but it continues generating bumper crops of hype. After seed developers first create a genetically modified strain with the desired trait—in this case, rice with beta-carotene—they start crossing it into varieties that have been shown to perform well in the field. The task is tricky: When you tweak one thing in a genome, such as giving rice the ability to generate beta-carotene, you risk changing other things, like its speed of growth. The Washington University anthropologist and longtime golden rice observer Glenn Stone describes this process as "bringing a superfood down to earth," and it gets little attention in most media accounts. Today, the IRRI coordinates the Golden Rice Network and has been working to develop a viable strain since 2006. And so far, it's having trouble. On its website, the IRRI reports that in the latest field trials, golden rice varieties "showed that beta carotene was produced at consistently high levels in the grain, and that grain quality was comparable to the conventional variety." However, the website continues, "yields of candidate lines were not consistent across locations and seasons." Translation: The golden rice varieties exhibited what's known in agronomy circles as a "yield drag"—they didn't produce as much rice as the non-GM varieties they'd need to compete with in farm fields. So the IRRI researchers are going back to the drawing board. Via email, I asked the IRRI how that effort is going. "So far, both agronomic and laboratory data look very promising," a spokeswoman replied. But she declined to give a time frame for when the IRRI thinks it will have a variety that's ready for prime time. Washington University's Stone says he visited the IRRI's campus in the Philippines in the summer of 2015 and heard from researchers that such a breakthrough is "at least several more years" off. The IRRI spokeswoman also declined to comment on Stone's time frame report. Of course, among people who think biotechnology has a crucial role to play in solving developing-world malnutrition, the IRRI's agronomic struggles are compounded by anti-GMO zealotry as well as what it sees as overregulation of GMOs in the global south. David Zilberman, an agricultural economist at the University of California-Berkeley, points out that most developing-world nations, including the Philippines, have adopted the Cartagena Protocol on Biosafety, which stipulates a precautionary approach to introducing new GMO products, including restrictions on how trials are conducted. The Cartagena regime stands in sharp contrast to the much more laissez-faire one that holds sway in the United States, Zilberman says. If the developing world embraced US-style regulation and treated vitamin A deficiency as a medical emergency solvable by golden rice, "it would have become available in 2000," Zilberman says. Based on that premise, he and German agricultural economist Justus Wesseler co-authored a 2014 paper claiming that golden rice has "been available since early 2000" and opposition to it has resulted in "about 1.4 million life years lost over the past decade in India" alone. Such claims abound in pro-GM circles. At a speech at the University of Texas last year, the Nobel laureate British biochemist Sir Richard Roberts accused golden rice opponents of have having committed a "crime against humanity." According to some researchers, opposition to golden rice has resulted in "about 1.4 million life years lost over the past decade in India" alone. To be sure, opposition to golden rice has occasionally gone overboard. In 2013, activists destroyed one of the IRRI's golden rice field trials in the Philippines, for example. "Anti-GMO activism has set back our work, in that we not only concentrate with our research, but we have to also spend time and resources to counter their propaganda," the IRRI spokesperson told me. But the group makes clear that regulation and activism are only two of the challenges facing golden rice—getting it to perform well remains a major task. Even if and when the IRRI does come up with a high-yielding golden rice variety that passes regulatory muster, it remains unclear whether it can actually make a dent in vitamin A deficiency. As the Washington University's Stone notes, vitamin A deficiency often affects people whose diets are also deficient in other vital nutrients. Vitamin A is fat soluble, meaning it can't be taken up by the body unless it's accompanied by sufficient dietary fat, which isn't delivered in significant quantities by rice, golden or otherwise. According to Stone, only one feeding study (PDF) has ever showed a powerful uptake of vitamin A by subjects eating golden rice. The paper was much cited by golden rice proponents, but Stone says it had a major flaw: The subjects were "well-nourished individuals" who already took in sufficient fat in their diets. The study "demonstrated only that Golden Rice worked in children who did not need it," hewrites. (The study has since been retracted on claims that the author failed to obtain proper consent from the parents of the participants). Meanwhile, as the IRRI scrambles to perfect golden rice, the prevalence of vitamin A deficiency is declining in the Philippines—according to the IRRI itself— from 40 percent of children aged six months to five years in 2003, to 15.2 percent in 2008. "The exact reasons for these improvements have not been determined, but they may be the results of proven approaches to preventing vitamin A deficiency, such as vitamin A supplementation, dietary diversification, food fortification and promotion of optimal breastfeeding," the group noted. That drop is part of a long-term trend that involves all of Southeast Asia. According to a 2015 Lancet study funded by the Bill & Melinda Gates Foundation, vitamin A deficiency plagued 39 percent of children in the region in 1991 but only 6 percent in 2013—without the help of golden rice. But VAD, as the deficiency's known, remains a huge scourge on the Indian subcontinent and in Africa, the study found, affecting more than 40 percent of children in both regions. Whether golden rice will ever help mitigate that ongoing tragedy won't likely be known for some time. But the technology's hardly the slam-dunk panacea its advocates insist it is.